I held a soldering iron for the first time in my life a few weeks ago. It was exciting and frustrating at the same time. Trying to melt a bead of solder to connect two parts proved more difficult than I expected it to be. But after several attempts, I finally managed to complete my little project (you can see it in action in the video). Those weren’t the most beautiful joins, but they worked. And the sense of accomplishment I felt as I proudly wore my little blinking robot pin the rest of the day far exceeded the actual amount of work I had done. That simple act of making something, of using a new tool, even if I weren’t particularly good at it, is something I will remember for a long time. So why was I soldering in the first place? I was at a “Mini Maker Faire” at the conclusion of a workshop at the Children’s Museum of Pittsburgh’s Makeshop. A group of us from museums around the country were there to learn about Makeshop and the maker movement, and to think about ways to incorporate that philosophy into our own work. And why was a historian involved in this? 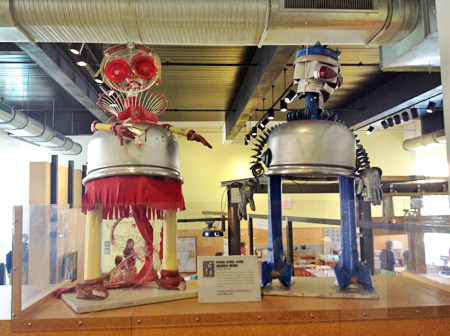 Throughout the Children's Museum of Pittsburgh, art and technology meet in whimsical ways, as this sculpture of "King Steel and Queen Iron" by Devon Smith (2001) illustrates. Photo by Joyce Bedi. I had a few reasons for wanting to attend. First, I’m a historian of technology and it’s important to me to understand how the stuff I study and write about works. And I like tools, so getting to try out some new ones is just plain fun. But I’m also the historian on the planning team for the new Spark!Lab that will open after the renovation of the Museum’s West Exhibition Wing, so it’s my job to think about ways to infuse hands-on activities with history. And while I don’t yet have a lot of answers about how we will do that, I did get some ideas from the workshop and my personal experience with that soldering iron. One of the workshop participants pointed out that kids are good at making the connection between the “do” and the “happen.” She suggested that, rather than just give kids tools, we could first ask what they want the tool to do, and then ask what they might invent that would do that. It seems to me that making a connection to history as the next question—how do you think people used to do this?—might work. We have actually been trying something like this in our Spark!Lab prototyping sessions. Kids and their families can pick up and examine an ice skate from about 100 years ago, look at sketches and patents for other types of ice skates invented over time, and then use the materials we provide to either invent the ice skate of the future or create something new that could move them across the ice. Spark!Lab emphasizes that invention is a process; incorporating stories from the past reveals that it is a continuum as well. 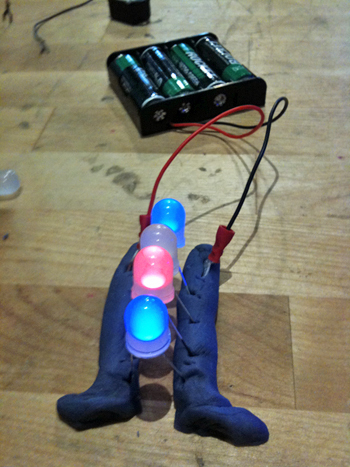 Another Makeshop project---"squishy" circuits made of boots (feet?) of clay carry electricity from the batteries to the LED lamps. Photo by Joyce Bedi. Perhaps the one thing that surprised me most about Makeshop, though, was how much it reinforces the research we are doing for our Places of Invention exhibition. In places as different as Hollywood in the 1930s and the Bronx in the ’70s, we have identified some common threads that tend to run through creative places. Rather than a recipe, we see these characteristics as ingredients of a strategy that helps people do their best work. Many of these elements are reflected in the 21st Century Skills framework as well. For example, flexibility is important to fostering critical thinking, problem solving, and creativity. Not only do minds need to be open to new connections and opportunities, but spaces need to be adaptable to new directions in work. Makeshop is a great example of this. Although the space is divided into three distinct areas—one for electrical projects, a woodshop, and a sewing area—everything in those spaces can be reconfigured quickly and easily. Tables and cabinets are modular and on wheels. Pegboards are metal so they can be used in the standard fashion and also with magnetic items. In short, the space is designed to suit the work, whatever it may be. 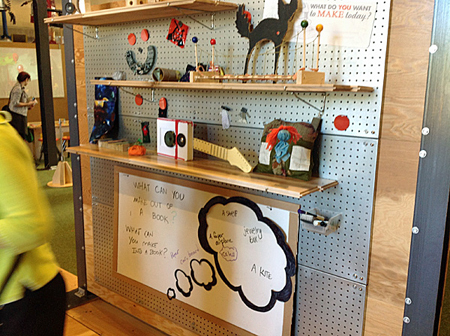 Makeshop's movable, reconfigurable tables, pegboards, and cabinets create the ultimate flexible environment. Photo by Joyce Bedi. That flexibility also makes the space conducive to collaboration, another characteristic of places of invention. Whether it’s one-on-one work with a Makeshop facilitator (like the student volunteer who, with enormous patience, helped me wield my soldering iron) or for family groups to work together on a project, the opportunity to work with someone else and learn from each other makes for a very fulfilling experience.